I can’t believe it is final reveal day. We have been working on a teenage boys room for several weeks now as part of the One Room Challenge hosted by Calling It Home . We moved into our home just 4 months ago and this room was literally a blank slate. It was been so fun working on the transformation of this space while also seeing our son get so excited about his new room. Here is a before picture just to remind us how far this room has come! And here is the after picture! Eeeeks! I can’t believe how far this teenage boys room has come in just a few weeks! Mixing shades of gray helped me create a tranquil space with a bit of a cool vibe! This is exactly what my son was hoping for! 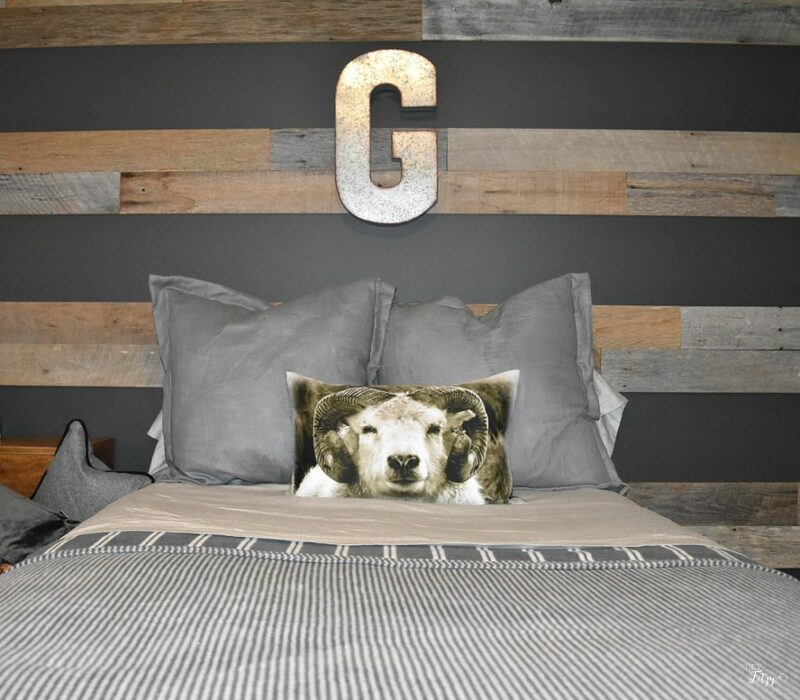 My son wasn’t too sure about the ram pillow at first but I love the bit of character it brings to the room. 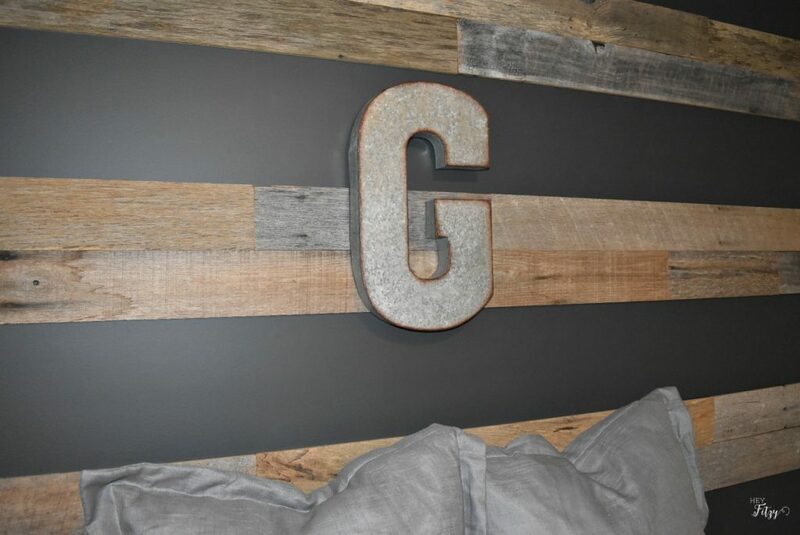 Hobby Lobby helped me score this metal G. It was the perfect size to bring a focal point to the barn wood wall we created. I found this fun little side table and basket at Home Goods! This metal basket has been in our laundry room for years. I moved it for this transformation and really like the way it looks in our teenage son’s room. 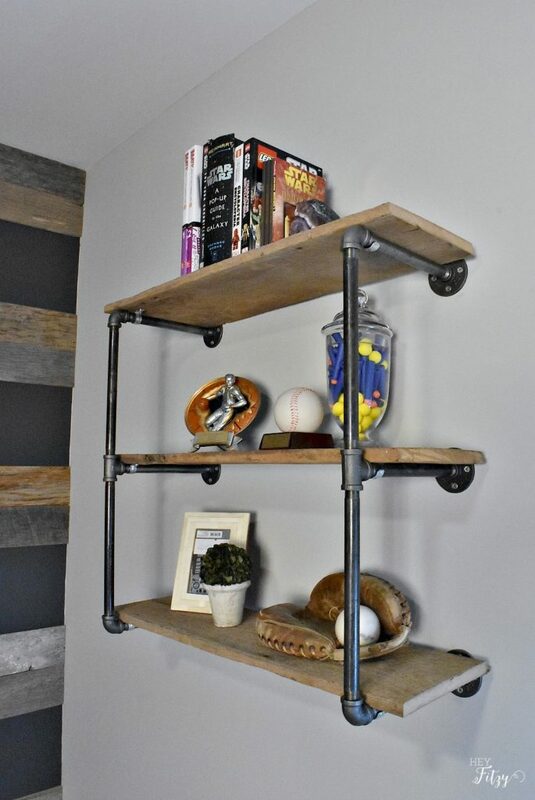 These industrial pipe shelves were a fun DIY project for the space. It took me a while to find just the right desk for this space. After searching hours online, you will never believe where I found it!!! Walmart people…Walmart! Seriously…that store has majorly upped their game in the last year or so! The cute little stool was a Home Goods find. 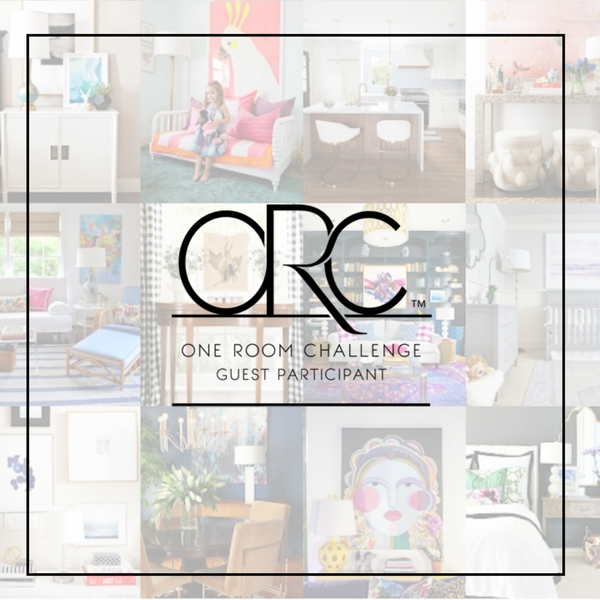 Thank you for all your support and kind words during the One Room Challenge. It has been a delight to transform our teenage son’s room from a blank slate into a cool retreat for him. 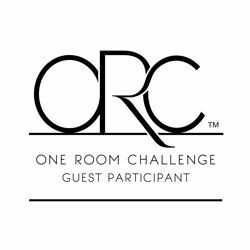 You can check out my other One Room Challenges below! Below are a list of sources for our teenage boys room! Wow...what a cool space your son! That accent wall is incredible. 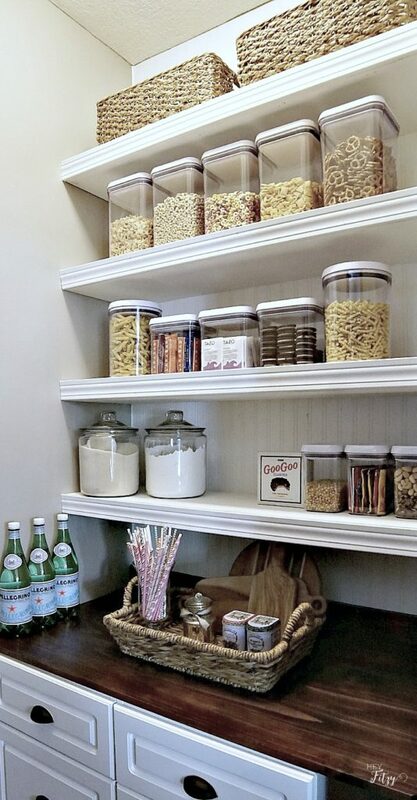 Love that industrial shelf and that "ram" throw pillos. Congrats on a wonderful makeover! I bet your son loves it! Thank you Tee! I absolutely loves his new space!! Thank you Susie! As a typical teenage boy...he doesn't say much. :) But I know he loves his new room so much. 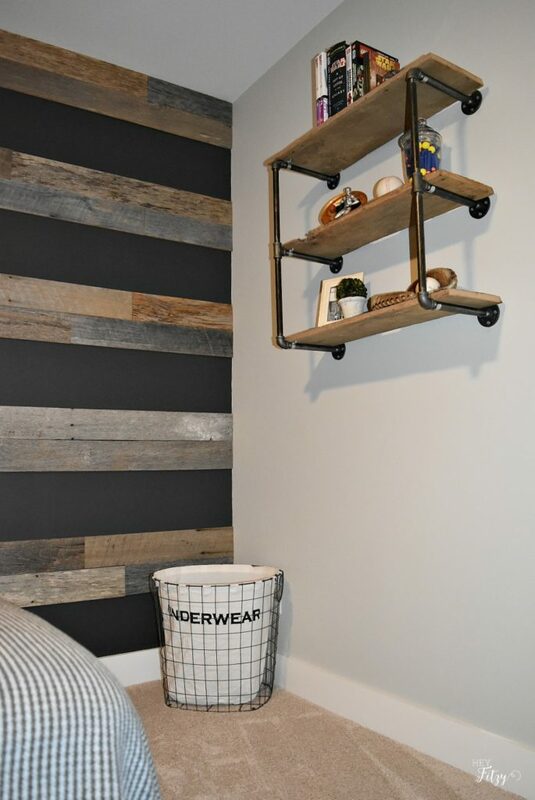 Your wall is one of the best wood walls that I have seen and the industrial shelf is perfect in this room. I know your son is going to love this space. Thank you Sherry! I really tried to do a little different take on the wood wall. We totally love the way it turned out! Awesome space! 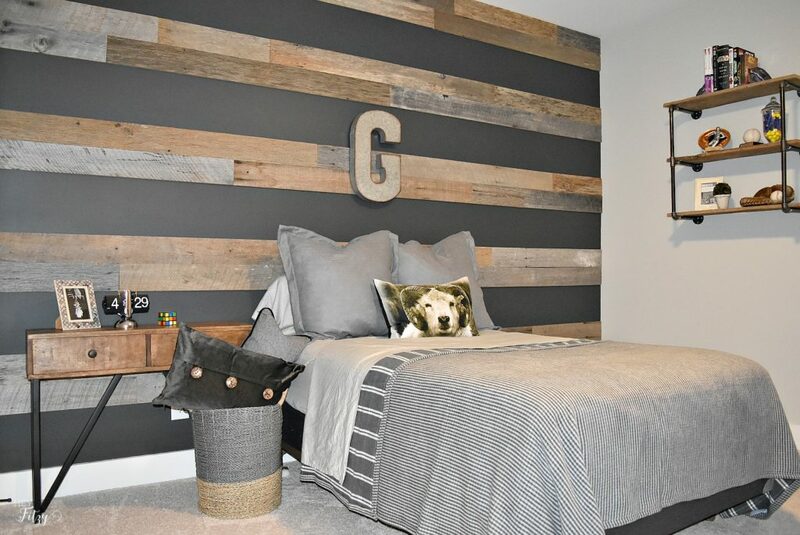 The striped planked wall steals the show! It’s amazing! Thank you Jessica! My husband was a little scared when we first painted the accent wall so dark. But with the wood, he loves the way it turned out! I adore that accent wall!!! 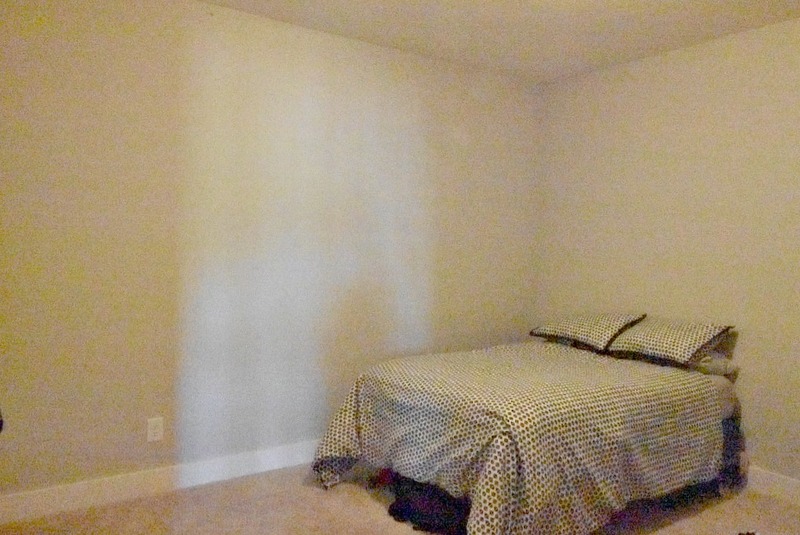 Your son is going to love this new space. Nicely done. Thank you Libbie! It was such a fun project to work on! Wow what a transformation. 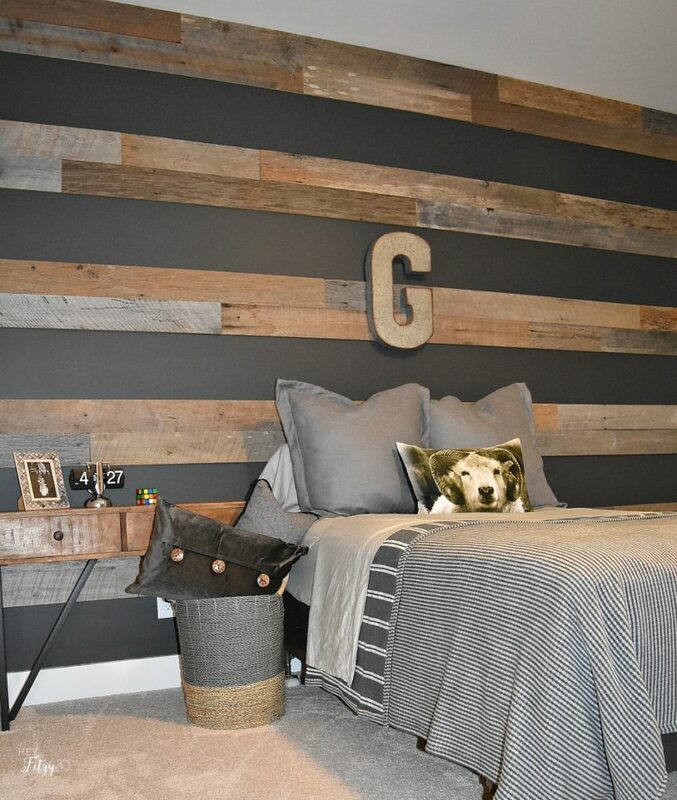 Love the wood wall. Great job! Thank you! 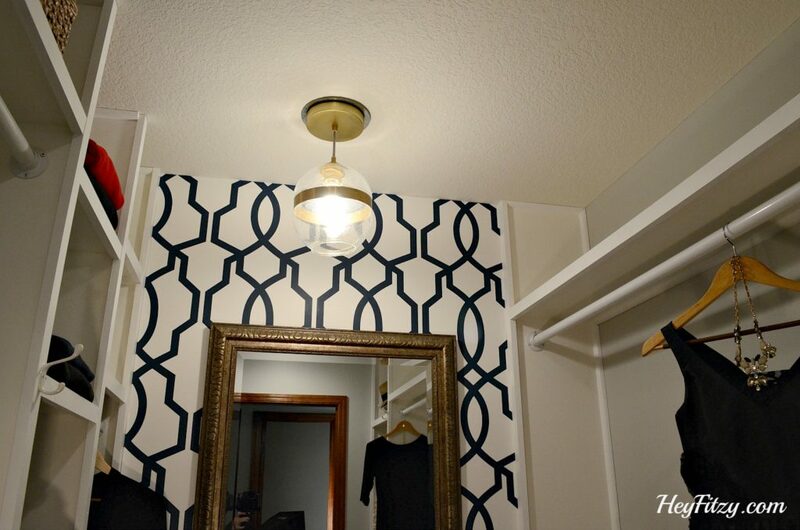 This room was truly a labor of love and we are delighted with the way it turned out! Hobby Lobby is the best! 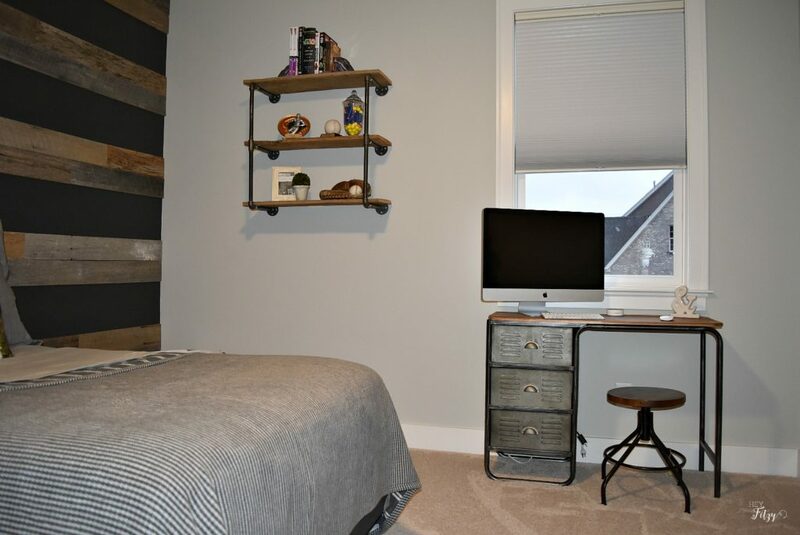 This space turned out amazing and is perfect for a teenage boy. 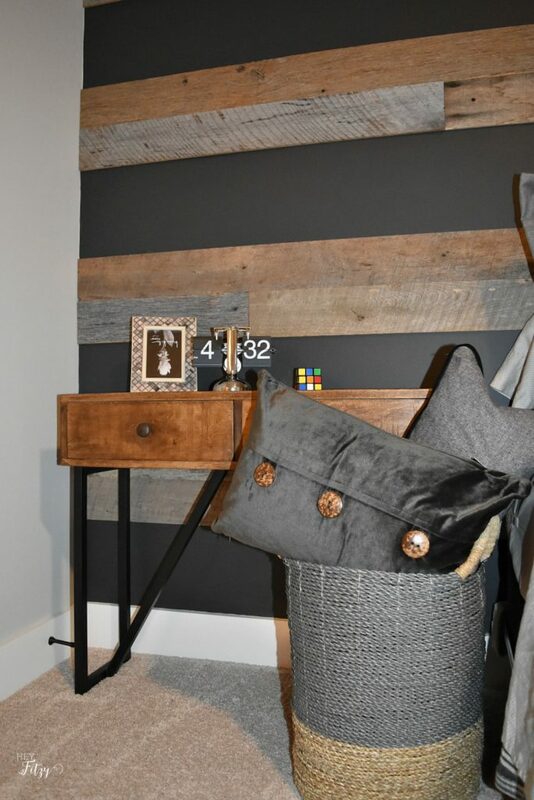 It makes me want to re-so my son's room! This is such a cool space for your teenage son! I love so many of the elements in this room! And I agree with you on the ram pillow, it looks great on the bed! Thank you Nicki! I think this is my favorite room in our entire home!! Now my girls are begging to get their rooms done next! 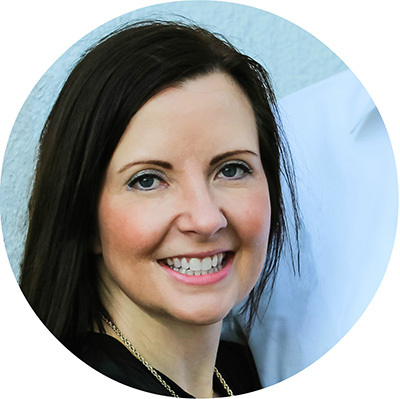 Tammy, my friend, what a great makeover! The color scheme is perfect for a young man and I am just dumbfounded that you found the industrial desk at Walmart! The "underwear" basket made me giggle and now I need one for my boy... maybe it will work. LOL Great job on the space! Tammy! Wow! It looks so fantastically cool...especially knowing the back story of you having to work around your other visiting son! I can only imagine how much your son enjoys hanging out in this space. And that desk! What a score! All around, you have to be one of the coolest moms on the block right now! Thank you Lynn! As you know with kids...it upped my cool factor for about 5 minutes. :) Well worth it!! This room turned out great! I love the accent wall! What a transformation! What a great room for a teenage boy! I am still all heart eyes over that focal wall and that desk!! Who knew Walmart was getting so decor savvy?! I hope he enjoys his new room, great job!!! Thank you Susanne! Walmart has seriously upped their decor game! I also saw some amazing dishes there the other day!! !